With LCD color displays getting used in mobile phones and the popularity of digital cameras gaining ground users were itching to see both the devices getting integrated. However camera phones were never a serious threat to digital cameras until recently when casual photography has shifted over to the smart phone. This is evident from the fall in sale of point and shoot cameras. Although the quality of photography provided by the smart phones has been improving, it hasn’t yet been able to attract the serious photographer. The innovation of camera sensor technology has enabled very high resolution pictures to be taken using the mobile phone camera, but besides the sensor a good camera needs optics too and this is where the form factor of the smart phone proved to be a hindrance. Today we have some smart phones which have attempted to breakthrough this obstacle. 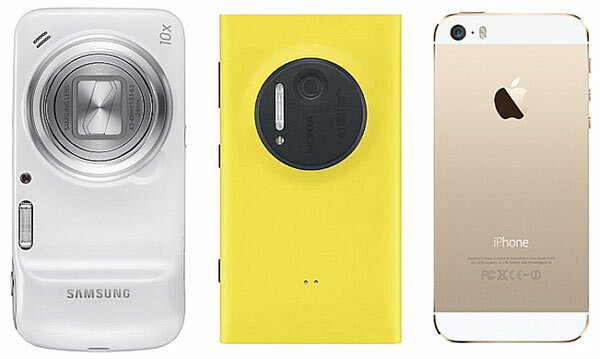 The three latest challengers to a digital camera are the Nokia Lumia 1020, Samsung S4 Zoom and the latest iPhone 5S. Let us check out how far they have succeeded. The Lumia 1020 camera is a fixed focus camera like any point and shoot camera but it has an impressive six piece set of Carl Zeiss lenses that focus the image onto an 1/1.5” back side illuminated sensor that produces a whopping 41 mega pixel raw data. Add optical image stabilization to that facilitated by a barrel shift actuator that moves the entire 6 piece lens compensating camera shake. The net result is that the Lumia 1020 clearly outsmarts all other smart phone cameras to date. The question anyone will ask is what is the 41 mp sensor doing in the camera with just fixed focus, f/2.0 aperture lens? The answer is that the huge data pumped out from the sensor is used by the PureView software to generate some amazing pictures that actually creates a 5 mp picture using the 41 mp data but improving the resolution by a process that Nokia calls ‘oversampling’ . The technique is best brought to play in producing cropped or zoomed images without any loss of resolution. This is how the flat piece of the sensor compensates for the lack of a set of zooming lenses that you see on the Samsung S4 Zoom. Like the S4 Zoom there is a xenon flash for excellent color and clarity and a 3 meter LED light for video recording. The camera has a mechanical shutter too but the processor takes a while to process the 41 mp information as a result of that you get a lower fps compared to say the iPhone. Due to its excellent engineering the product rules today until the next breakthrough in camera technology or perhaps it needs a dedicated cpu to do the image processing. However serious photographers have yet to ditch their compact camera system in favour of the Lumia 1020. The Samsung S4 Zoom took the risk of physically merging a compact camera to its smart phone to produce a 15 mm thick phone that is 5 mm thicker and 50 gms heavier than the Lumia 1020 but incorporated a Carl Zeiss Tessar lens system to provide 10x optical zoom. While balancing specs and cost and performance a smart phone designer does not have to scratch his head a lot. However it’s a different ball game in case of a camera. Samsung has the advantage of being a leading manufacturer and designer in both the phone as well as the camera world. Keeping that in mind the marriage of the phone and the camera isn’t as grand as one would have expected. The phone part is comparable to a S4 Mini but the camera part of the deal isn’t really breathtaking. The most compelling reason for the mismatch is costs. The S4 Zoom uses a smaller back side illuminated sensor which coupled with its lens system produces an effective 16 mp data but produces a good depth of focus compared to other smart phone cameras with higher mega pixels where the pictures appear very flat. The S4 Zoom is a winner when it comes to close ups though, the Lumia 1020 fails miserably. The iPhone 5s does not claim to have the best camera, however it’s a general consensus that Apple phones always have the leading camera technology and performance in their latest launch. The specs of the 5S definitely lags the specs for the other two phones in contention. The iPhone has a five element fixed lens along with image stabilization, The sensor is’nt as large but produces data for 8 mega pixels from a larger BSI pixel ( 1.5 micron ) which accounts for higher noise reduction. Apple has always set up its own benchmark and just like the case of the recent display fight where they refused to provide a display larger than your hand and didn’t go overboard with pixels per inch stating that the human eye will not be able to perceive density higher than what they have designed, the iPhone camera too is an optimized piece of engineering. It does not make promises to shoot pictures that you can blow up as posters or to create your fashion portfolio. The iPhone 5S camera is about the best camera that you would need to upload your shots to say your FB page or share some party shots, yes maybe casual travel photography too.